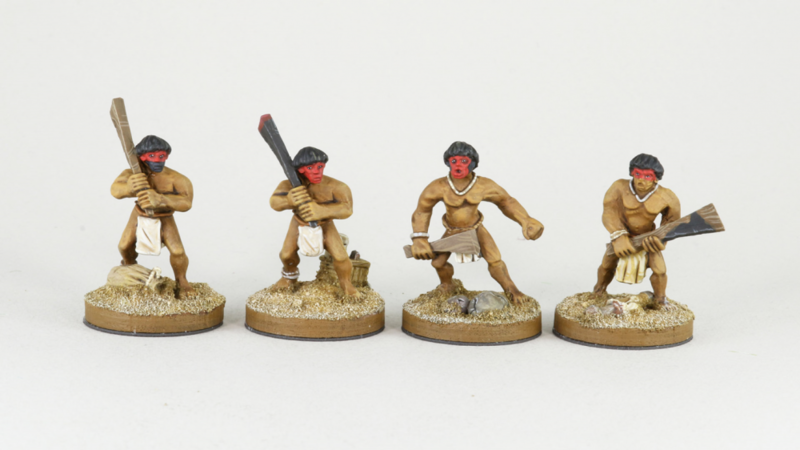 Pontoonier Miniatures has released new 28mm Carib figures and Badger Games has got'em! Feared for stories of cannibalism, head-hunting and human sacrifice, the Caribs were originally the dominant population in the Caribbean Islands to which they gave their name. These figures are intended to represent the indigenous peoples of the Caribbean Islands from the first contact of Columbus to their general absorption into the new local populations. They will serve as opponents for Spanish Explorers, Colonial Powers in the 15th through 18th Centuries and of course, Pirates! Additionally, this dress survives up to today in the Islands outlying South and Central America as well as some tribes of the Amazon Jungles. These figures will work for the classic age of late 19th and early 20th Century Amazonian exploration to today. The possibilities are endless. The first release is made up of command packs and the first of the warriors...20 figures in all. Subsequent packs will include warriors with blowguns, firearms, civilians and casualties. Leader types come with socket wrists and hands with various weapons for conversion. Watch this space for more announcements in this fantastic range! This entry was posted on Tuesday, March 27th, 2018 at 19:55 and is filed under News. You can follow any responses to this entry through the RSS 2.0 feed. You can skip to the end and leave a response. Pinging is currently not allowed. very nice, the bottom ones are great too as they should be nice and quick to get a decent amount painted. Very interesting, I always thought that they were missing in pirate games. They were certainly still very present c.1700 in Hispaniola (Haiti) for example, French witnesses mention discussing and trading with them.